Edgar Allan Poe’s bust, at the Boston Public Library. After making a brief appearance in 2014, a bronze bust of Edgar Allan Poe has returned from storage this week to the Boston Public Library, where it will stay for, perhaps, evermore. The bust, created by sculptor Bryan Moore and his team, is part of a display that will grace the library’s newly renovated Johnson building in Copley Square, which will be celebrated with a ribbon-cutting ceremony on Saturday when it opens to the public. “This was an opportunity to take a lot of our artwork and put it out publicly in the new space,” said Michael Colford, director of library services at the BPL. The renovation project cost roughly $78 million, and it took three years, in two phases, to complete, he said. The Poe bust was funded through a Kickstarter campaign launched two years ago by Moore, who won the backing of “Game of Thrones” author George R.R. Martin and film director Guillermo del Toro. It was dedicated in October of 2014 and then swiftly packed away. The piece now is in the fiction section, on a shelf facing the windows that overlook Exeter Street, where passersby can see its deadpan gaze. The likeness, which is fitting not just because of Poe’s achievements as an author but also because of the eerie scribe’s tempestuous ties to the city, is paired with a plaque bearing the names of all of the donors — the famous ones top the list — who made the project possible. Moore applauded the return of the sculpture, an almost cartoon-like rendition of the author, his wind-swept hair above his sullen eyes. 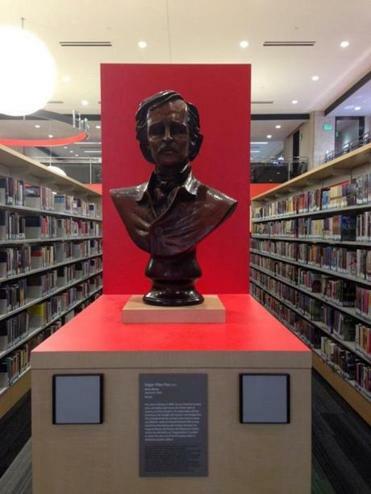 “When the project team and I donated the Poe bust to the library, its exact display location was unknown, so we provided a bust pedestal and donor plaque so that it could be placed anywhere in the fair and pillared halls,” Moore said in a statement. He added that he is happy with how the library installed the work. As part of the campaign to fund the Poe statue, Moore had also promised to donate money to the city’s “Read Boston” early literacy program. He will give a $1,000 check to the organization in August, he said. There will be plenty of other artwork on display in the library’s renovated space when it opens, so those who aren’t fans of Poe’s portentous poetry and prose can find something else to feed their aesthetic desires. Colford said in a telephone interview that three more busts will also be placed on shelves near the Poe sculpture. They depict Maya Angelou, Henry James, and Mark Twain. Nearby, “The Griffin,” a copper half-eagle, half-lion statue that once adorned the roof of the library’s McKim building, will fly above the books.